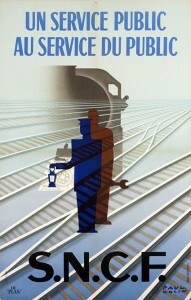 Paul Colin SNCF Poster 1947? Here is a poster announcing the newly-nationalised French railways, called SNCF. The French railways were nationalised in 1938. I’m not sure exactly when this poster was made. I thought 1940s, but it could be earlier. I’ll have to check. The poster is by Paul Colin, one of the great masters if French poster design. During the 1920s and 1930s he created many great entertainment posters, especially for the American dancer, Josephine Baker. Colin helped to create the dynamic image of Baker. Colin ranks along with Cassandre and Loupot as one of the great poster designers of the 1930s. Interestingly, Colin started his own school of design…and taught many of the next generation of poster designers!